Plain White Wedding Dress Airline Travel Box. It weighs 550gms. flying out of the UK airports. They are made from acid free/ph neutral material, have a strong White Leather. Strong White Leather Handle. 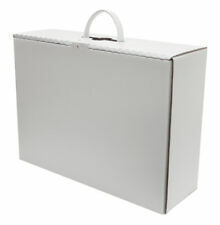 Plain White Wedding Dress Airline Travel Box. It weighs 550gms. flying out of the UK airports. They are made from acid free/ph neutral material, have a strong White Leather. I send them out ready made in a sturdy brown protective corrugated box so you. ~ PERSONALISED VINYL STICKER/DECAL FOR A WEDDING DRESS STORAGE BOX ~. 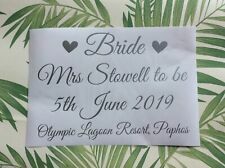 Eg Bride, Mrs Smith to be, 10th October 2019, Paphos, Cyprus GOLD. These boxes are suitable to carry as hand luggage on most airlines throughout the world. Having your beautiful wedding dress close by & safe will give you peace of mind as you fly to your overseas wedding location. These boxes are suitable to carry as hand luggage on most airlines throughout the world. Perfect for overseas weddings. A beautiful Wedding Dress Travel Box,"Bride with diamante swirls, date and location". These boxes are suitable to carry as hand luggage on most airlines throughout the world. A beautiful Wedding Dress Travel Box with any date and location. Ribbon colours silver, purple, blue, gold, pink, red, green, orange, black, cream, yellow, white, brown etc. Personalised wedding dress travel/storage box vinyl sticker, any layout or design can be created using a wide range of colours including gold, silver, black, white, pink, red, blue, purple, and more. Wedding dress Travel/storage box. Bride, Gold,Silver or Black letters. Having your beautiful wedding dress close by & safe will give you peace of mind as you fly to your overseas wedding location. These boxes are suitable to carry as hand luggage on most airlines throughout the world. wedding dress travel box. Condition is Used. Stunning wedding box only used once fantastic quality ribbon and paper work still in box unopened Dispatched with Royal Mail 2nd Class. These boxes are suitable to carry as hand luggage on most airlines throughout the world. A beautiful Wedding Dress Travel Box,"Bride" with date. The Wedding Box size is: 55 x 36 x 20cms. Ribbon colours silver, purple, blue, gold, pink, red, green, orange, black, cream, yellow, white, brown etc.